$3374.09+ Threadripper Workstation - Rendering + Picture edit. keys were a tad taller than the usual office keyboards from dell or hp. I think that it is a little expensive compared to what you can get for other keyboards and the space and shift buttons wobble too much for the price. This was a gift for my 21st, from my best friends. Thanks guys! My first mechanical keyboard- with Cherry MX Blue switches. The clicky sounds are awesome, and it really is a pleasure to type with . Frankly, the switches aren't as noisy as expected- I play in my bedroom so it doesn't matter, but definitely consider a quieter switch if you plan to use it in the office or something. A great keyboard, wont go back to dome again! Very good, the Cherry MX Brown keys are good, but can be a little noisy when typing. I would probably prefer a good quality membrane keyboard over this because it is the most quiet, however, you must be careful with membrane, because some of them can be very bad (Not picking up multiple keys properly). First mechanical keyboard. The feels... Got it in a Prime deal on Amazon. No regrets. My first mechanical keyboard. It's great and has a more subtle look to it which I appreciate. My first mechanical keyboard. Feels very nice to write on, no problems what so ever. I chose it for the simple black & white design, because I'm not a fan of these gamery RGB keyboards. Bit overpriced I'd say, buy it when it's on sale! 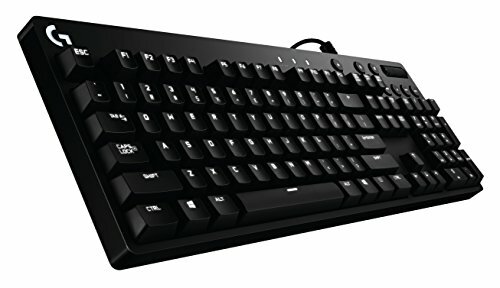 It's a good little mechanical gaming keyboard that allows you to take advantage of the excellent Logitech Gaming Software interface on a keyboard with actual Cherry MX switches. Not many options if you don't want to use the software, as there's no way to adjust lighting from the default wave animation unless you're using it. If you plan on getting a Logitech mouse to go with it, this is a great choice so that you can take care of all the settings in one place. Otherwise grab it when it's on sale. Great Cherry MX Brown keyboard with a nice key layout and a nice tactile feel.